This document describes an interoperability test, executed by various members of the Multimodal Interaction Working Group, to demonstrate interoperability of multimodal components which are implementing the "Multimodal Architecture and Interfaces" [ MMI-ARCH ] specification. This is the 23 January 2012 W3C Working Group Note of "MMI interoperability test report". This W3C Working Group Note has been developed by the Multimodal Interaction Working Group of the W3C Multimodal Interaction Activity. Comments for this note are welcomed and should have a subject starting with the prefix '[INTEROP]'. Please send them to www-multimodal@w3.org, the public email list for issues related to Multimodal. This list is archived and acceptance of this archiving policy is requested automatically upon first post. To subscribe to this list send an email to www-multimodal-request@w3.org with the word "subscribe" in the subject line. This document was published by the Multimodal Interaction Working Group as a Working Group Note. If you wish to make comments regarding this document, please send them to www-multimodal@w3.org (subscribe, archives). All comments are welcomed and should have a subject starting with the prefix '[INTEROP]'. The W3C MMI Working Group developed the “Multimodal Architecture and Interfaces” specification [ MMI-ARCH ], which is a W3C Candidate Recommendation since January 2011. To prove implementability various working group members (Openstream, France Telecom and Deutsche Telekom) initiated an interoperability test activity. The goal of this activity was to build a multimodal system based on components from the different participants and to prove and demonstrate interoperability of the components by using a simple application. The key principles of the Multimodal Architecture are to treat Modality Components as 'black-boxes', making no assumptions about their internal implementation and allowing them to communicate solely through the life-cycle events as described. The architecture supports extension of functionality through extension-events, but requires that modality components do not communicate directly with each other, but only through the Interaction Manager. The current exercise, is to verify that MCs developed by different vendors, can actually communicate through life cycle events and verify the architectural principles outlined in the Multimodal Architecture and Interfaces specification [ MMI-ARCH ]. The multimodal system has been built using 3 architectural components: one Interaction Manager and two Modality Components. All 3 components have been provided by different participants. The following figure gives an overview of the structure of the system. As shown in the figure the system consisted of a voice modality component and a graphical modality component (GUI). The system has been set up as a distributed environment and HTTP has been used for the lifecycle event transport. A description of the details of the lifecycle event transport can be found in the "Multimodal Architecture and Interfaces" [ MMI-ARCH ] specification. The Interaction Manager is an HTTP server that runs SCXML applications and processes MMI life-cycle events. The server manages multiple SCXML interpreter instances simultaneously (one per each application context). Life-cycle events are transported via HTTP as described in Appendix E of the Multimodal Architecture and Interfaces specification. The server is Java-based and uses Commons-SCXML to interpret SCXML. HTTP transport and internal event routing is handled by Mule ESB. An additional instanceId parameter has been added to initial HTTP requests sent by distributed Modality Components to enable instance (context) sharing. The instanceId parameter needs to be configured on each Modality Component that wants to share a context with another Modality Component. If the IM receives a NewContextRequest message with an attached instanceId that matches a previously received value, it will reuse the previously generated context ID in the NewContextResponse message. If no match is found for the provided instanceId or if the parameter is missing, the IM will generate a new context (state machine instance). The graphical modality component has been implemented using HTML [ HTML401 ], ECMAScript [ ECMA-262 ] and XMLHttpRequests [ XMLHTTPREQUEST ]. The graphical modality component acts as a wrapper around the application specific HTML (see below) and handles DOM events (such as click or focus) generated by the application specific HTML. The graphical modality component uses XMLHttpRequests [ XMLHTTPREQUEST ] to send these events (wrapped in MMI lifecycle events) to the server side interaction manager. Lifecycle events are received from the interaction manager also usint XMLHttpRequests (see also "Authoring Applications for the Multimodal Architecture" [ MMI-AUTH ] for a more detailed description). PrepareRequest The component does not take any action on a PrepareRequest. PrepareResponse The component does not send a PrepareResponse. DoneNotification Not used by the modality component. CancelRequest This component cannot cancel. CancelResponse The component does not send a CancelResponse. PauseResponse The component does not send a PauseResponse. ResumeResponse The component does not send a ResumeResponse. ExtensionNotification (focus) The component sends an “ExtensionNotification” lifecycle event to the IM when an input field gets focus. The attribute “id” contains the elements ID within the HTML document. ExtensionNotification (click) The component sends an “ExtensionNotification” lifecycle event to the IM when a button was clicked. The attribute “id” contains the buttons ID within the HTML document. ExtensionNotification (change) The component sends an “ExtensionNotification” lifecycle event to the IM when the content of an input field was changed. This event will not be sent until the input field loses focus. The attribute “id” contains the input fields ID within the HTML document. ExtensionNotification (setValue) The IM can send an “ExtensionNotification” lifecycle event to the modality component to set a value of an input field. The attribute “id” must contain ID of the HTML element. ExtensionNotification (setFocus) The IM can send an “ExtensionNotification” lifecycle event to the modality component to set the focus of an input field. The attribute “id” must contain ID of the HTML element. StatusRequest The component does not take any action on a StatusRequest. StatusResponse The component does not take any action on a StatusRequest. The Openstream Voice modality component(VoiceMC) is a fully conformant MMI Modality Component providing both speech-recognition (ASR) and text-to-speech (TTS) functions. It is available on various mobile and desktop platforms including iOS, Android, Blackberry, Windows Phone, Windows XP and Windows 7. Both embedded as well as MRCP v1 and v2 compliant remote speech engines are supported. The iOS implementation of the VoiceMC running on an iPhone device running iOS 4 was used for the interoperability test. The iOS instance of the VoiceMC has been implemented in Objective-C and it uses embedded ASR and TTS engines for speech-recognition and text-to-speech. VoiceMC communicates with an Interaction Manager(IM) using the standard MMI [MMI-ARCH] lifecycle events. HTTP is used as the transport protocol, with the component acting as a client and always initiating the connection request to the IM acting as the HTTP server. Lifecycle events that are initiated by the component are sent to the IM using HTTP POST requests. HTTP GET requests are used to receive responses from the Interaction Manager, as well as to receive new lifecycle events initiated by the IM. On startup, the VoiceMC sends the NewContextRequest MMI lifecycle event to establish a context with the IM. Once the context is established, IM can add/remove speech recognition grammars and initiate ASR/TTS operations using the standard MMI lifecycle events. Speech recognition grammars can be added or removed using the ExtensionNotification lifecycle event. Speech-recognition and text-to-speech operations can be initiated by sending the StartRequest lifecycle event. Speech recognition result is formatted as an EMMA document and sent to the IM in the DoneNotification lifecycle event. PrepareRequest The component requires a PrepareRequest event to initiate a session with a remote Voice server. PrepareResponse (Standard) The component establishes a remote Voice server session. CancelResponse StatusInfo field is "cannot cancel". PauseResponse StatusInfo field is "cannot pause". ResumeResponse StatusInfo field is "cannot resume". For the purpose of showing interoperability a simple math-quiz application has been developed: the quiz consists of a series of questions given one by one until the player chooses to stop. The question is going to be presented by voice and visual output. The user has the opportunity to answer the quiz question either by voice or by GUI input. Correct solutions are given immediately after the player's answers. At the same time (while starting the GUI component) the VUI component plays a prompt with the question “what is two plus two?”. The following section describes the detailed event flow during application execution and shows the details of each lifecycle event. Figure 1 shows the initialization sequence. The dotted rectangle on the left hand side shows visual representation of the graphical modality component. During the initialization the graphical component has not loaded any visual content. After all modality components have connected to the interaction manager, the preparation sequence is started by the interaction manager. In this configuration the voice modality component is instructed to load application specific grammars. The graphical component still has not loaded any visual content. Now, as the voice modality component has been prepared, the interaction manager starts the actual application. It sends StartRequests to both modality components. 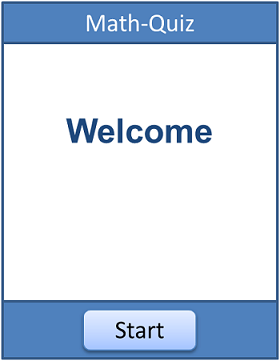 The graphical modality component loads and displays the "welcome.html" page, which is shown on the left hand side. The voice modality component plays the following prompt to the user: "Welcome to the Math-Quiz. Please press 'Start' to continue." To start the application, the user presses the "Start" button on the graphical modality component. This leads to an ExtensionNotification lifecycle event, which contains the click event represented within an EMMA [ EMMA ] document. The interaction manager script sends StartRequests to both modality components. The graphical modality component loads the visual representation of the first math quiz question whereas the voice modality is instructed to play the question "What is 7 plus 9?" The user now uses the keyboard to enter the answer (types "1" and "6"). The application dependent HTML has been written in a way that the change event is used to send the value of the input element to the interaction manager. The change event is thrown as soon as the input element looses its focus (and not when the actual input occurs, this is why there is no lifecycle event generated as a direct result to the keyboard input of "1" and "6"), which happens when the user clicks the "check" button. Thus two lifecycle events are sent to the interaction manager immediately after each other. The interaction manager script (application dependent SCXML, see below) checks the users input. Since the answer is correct, it sends an ExtensionNotification lifecycle event to the graphical modality component to change the result indicator to green color. A StartRequest is used to instruct the voice modality component to play "This is correct. Please press 'Next' for another question or press 'Stop' to finish the application." Since the user clicks "Next", the graphical modality component again sends an ExtensionNotification lifecycle event to the interaction manager. As above, the interaction manager script instructs both modality components to load new markup and play a prompt to present the next math quiz question to the user. This time the user decides to use the voice modality to answer the question. To activate the speech recognition he clicks the microphone button at the GUI. Again, a generic lifecycle event is sent to the interaction manager, representing the click at the microphone HTML element. 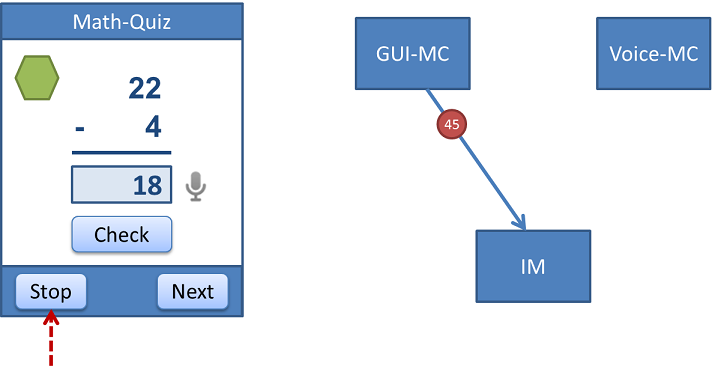 The interaction manager script sends a StartRequest lifecycle event to the voice modality to instruct it to open the microphone and start the speech recognition process. The user speaks "twenty" into the microphone. After automatic endpointing the voice modality component uses a DoneNotification lifecycle event to send the users input to the interaction manager. Note that this information is represented using an EMMA document. 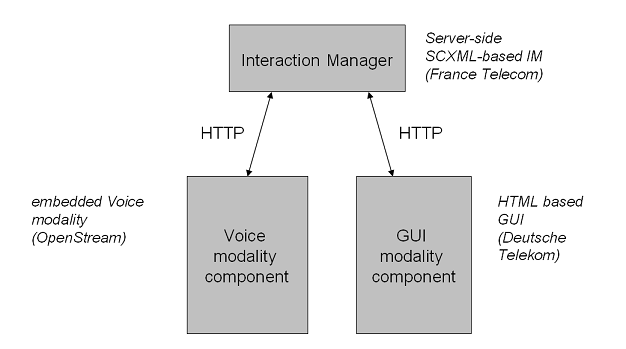 To display the result of the voice input at the GUI the interaction manager script sends an extensionNotification lifecycle event to instruct the graphical modality component to change the value of the HTML input field accordingly. Again the user clicks the "Check" button at the GUI to check the input for correctness. Since this answer is not correct, the interaction manager instructs the voice modality component to play "This is not correct. Please try again." Note that the voice modality component sends two lifecycle events in response to the StartRequest. A StartResponse immediately after it has started to play out the prompt and a DoneNotification once it has finished the prompt. Again the user tries to answer the questions, this time using the keyboard. He types "1" and "8" on his keyboard. Again, since this is a generic behavior of the graphical modality component, two lifecycle events are sent to the interaction manager immediately after each other. This input is checked within the interaction manager script and since it is correct the interaction manager will send lifecycle events both modality components to change the visual indicator to green color and to play "This is correct. Please press 'Next' for another question or press 'Stop' to finish the application." The user decides to stop the quiz at this point and clicks the "Stop" button at the GUI. The interaction manager now sends StartRequests to both component to display a "Goodbye" page and play "Thank you and goodbye." The application consists of two components which use markup languages. The interaction manager uses the state chart description language SCXML [ SCXML ] to build the application specific functionality, whereas the GUI modality component uses HTML [ HTML401 ] for the application specific part. The following figure shows a visual representation of the interaction manager state machine. Send 'welcome' StartRequests to both Modality Components. Provide HTML page URL in the GUI-MC StartRequest, and text to synthesize in the Voice-MC StartRequest. Process ExtensionNotification events from Modality Components. At this stage, we collect and register GUI events. Once a condition has been satisfied (a "clicked" event occurred on the "start_button" object), proceed to the next state. Load a question. In a more complex setup, this could mean fetching data from a question database; here, we simply switch between two hardcoded question/answer pairs. Send 'question' StartRequests to both Modality Components. Send 'goodbye' StartRequests to both Modality Components. The following markup code shows the SCXML which describes the application logic. The code is loaded by the interaction manager at application start. xsi:schemaLocation="http://www.w3.org/2005/07/scxml scxml.xsd http://commons.apache.org/scxml commons.xsd http://www.w3.org/2008/04/mmi-arch mmi.xsd http://www.w3.org/2003/04/emma emma.xsd" version="1.0"
The following HTML code shows the welcome.html page, which represents the application specific markup and will be loaded from the graphical modality component as a reaction to a mmi:StartRequest lifecycle event. The application code above contains some ECMAScript varialbes (arrays such as EVENTTYPES). These variables give the application author control over which DOM elements are to be handled by the graphical modality component wrapper and forwarded to the interaction manager. This functionality is used to optimize performance and to avoid flooding the interaction manager with events like mouse movements or hover. There are similar HTML documents for other stages of the application which will be loaded in reaction to other mmi:StartRequest lifecycle events. 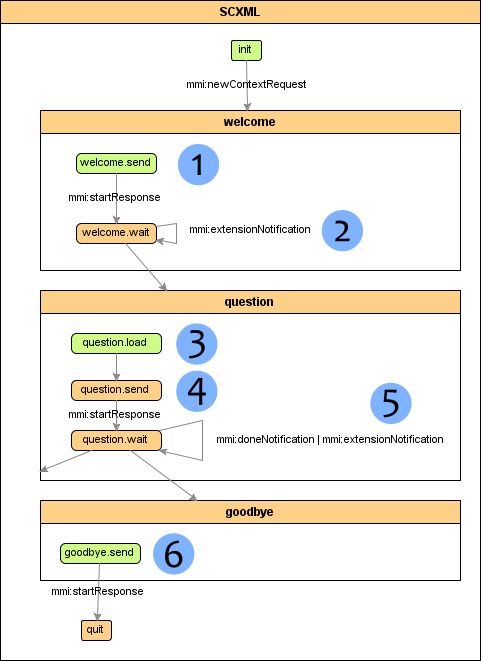 The modality component loads this grammar in response to a ExtensionNotification lifecycle event (see description above). Recognition results are compiled into an EMMA [ EMMA ] document and sent to the interaction manager using a DoneNotification lifecycle event. The authors would like to recognize the contributions of the members of the W3C Multimodal Interaction Group. Special thanks to Thomas Ziem (T-Systems) and Jakob Sachse for supporting the test activity.